Humanity is a single race divided by prejudice, misunderstanding and fear in this ambitious ensemble drama. Set in Morocco, Japan, Mexico and America, it follows the consequences of one random act as it reverberates around the world. Brad Pitt, Cate Blanchett, Adriana Barraza and Gael Garcia Bernal co-star in a film with a jigsaw puzzle structure that demands full attention but proves well worth the effort. 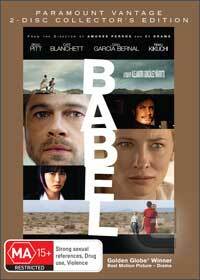 Babel is Iñárritu’s follow-up to 21 Grams and the conclusion of a trilogy that began with Amores Perros which is a very modern story of alienation, dealing with some of today’s political hot topics such as illegal immigration and terrorism. Babel won’t appeal to everyone, its slow in parts but its beautifully acted and ambitiously directed and has interesting things to say about the way we live now.